Siobhán Hapaska was born in 1963 in Belfast, Northern Ireland. Often difficult to categorise, her work is a poetic play of imagery and ideas that forge discordant connections. A complex and interwoven narrative is articulated through a wide vocabulary of materials incorporating extraordinary objects ranging from olive trees to magnets, tumbleweeds to selenite. Hapaska’s solo exhibitions include Museum Boijmans Van Beuningen, Rotterdam (2015); Magasin 3, Stockholm (2014); Camden Arts Centre, London (2007); Kerlin Gallery, Dublin (2001, 2011); Sezon Museum of Art, Tokyo (1999) and Tanya Bonakdar Gallery, New York (1997, 2010). In 1997 she took part in Documenta X. She represented Ireland at the 2001 Venice Biennale and showed with the Azerbaijan Pavilion in 2015. 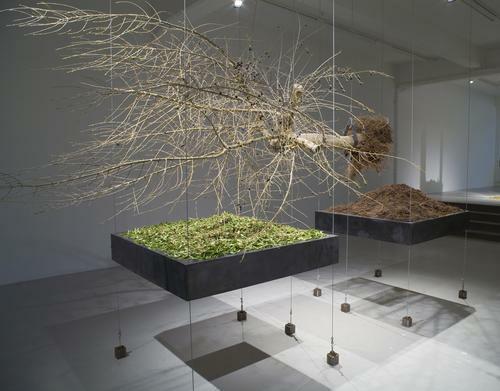 For MAGNETISM Hapaska presents Downfall (2009-2015), a work which consists of eleven olive trees hanging horizontally in space and continuously shaking throughout the duration of the exhibition. In Greek mythology, the olive tree symbolizes the birth of Western civilization. The trees also possess symbolic value for Islam, Christianity and Judaism.